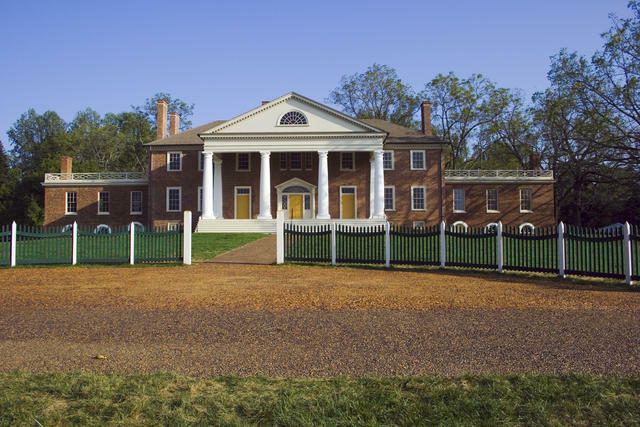 After the the columns were whitewashed the Portico became a much more prominent feature of Montpelier's façade. The freshly whitewashed columns were truly a “dazzling white” color and they unquestionably draw a visitor's eyes towards the portico. Another advantage of the whitewashed columns is that the finish can be easily renewed over time. If the columns were left the natural tan color of the stucco, then it would have been very difficult to clean or refinish them when the surface of the column became dirty or damaged. Because the columns are now whitewashed, renewing the finish is a fairly simple job of just applying another coat of whitewash. Historically this advantage may have caused a vast majority, if not all, of the other stuccoed brick columns to be painted white by the mid-19th century, although a growing interest in classical Greek and Roman architecture also undoubtedly played an important role in the wide-spread adoption of white columns. Montpelier's Portico after the columns were whitewashed.